Discount Tire has been in business since 1960 and has grown to become the world's largest independent tire and wheel retailer. Our goals are to provide affordable pricing, quality products, and excellent customer service. At Discount Tire, we offer all the majorl tire brands including Michelin, Goodyear, Pirelli, Dunlop, Toyo, Yokohama, BFGoodrich, and many others. Shopping for wheels? Find what you are looking for at Discount Tire. From Ace, Beyern Wheels (exclusively for BMW), and Konig to Voxx, V-TEC, Petrol Wheels, and more, we are sure to satisfy your tire and wheel needs. 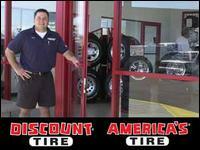 Visit any one of our Discount Tire stores and see the difference for yourself. Check out our website for the appointment setting feature, special promotions, reviews, and our Interactive Wheel System which allows you to see wheels on your vehicle! We look forward to seeing you at Discount Tire!